East London night of resistance – resistance goes on undeterred…. On Wednesday 28 October, Focus E15 campaign, East London Radical Assembly and Fight Racism! Fight Imperialism! organised a night of resistance in a local Stratford pub. After a great evening of film showings, discussion, poetry and music, the plan was to join the rough sleepers and homeless people overnight in the old Stratford Centre/mall to highlight the fact that rough sleepers are regularly kicked out of the mall and often spend the night in the grounds of the local church. Suspiciously however, on the day of the event, a notice went up to say that the Stratford Centre would be closed from 11pm to 5am for ‘maintenance works’. We then found out that the police had been on the phone to the pub all afternoon, hassling them to cancel our social event and discussion about the escalating housing crisis. The pub realised that this was absurd and said no. We are clear that this is Newham Labour council and the police working together to intimidate the pub and silence our campaign. We also saw police ‘guarding’ the grounds of the local church at night, presumably to stop people from sleeping there. Of course, when we arrived at the mall there was absolutely no sign of any maintenance work. The police guarded all entrances but we led a lively and noisy demonstration just outside and told passersby what was going on. 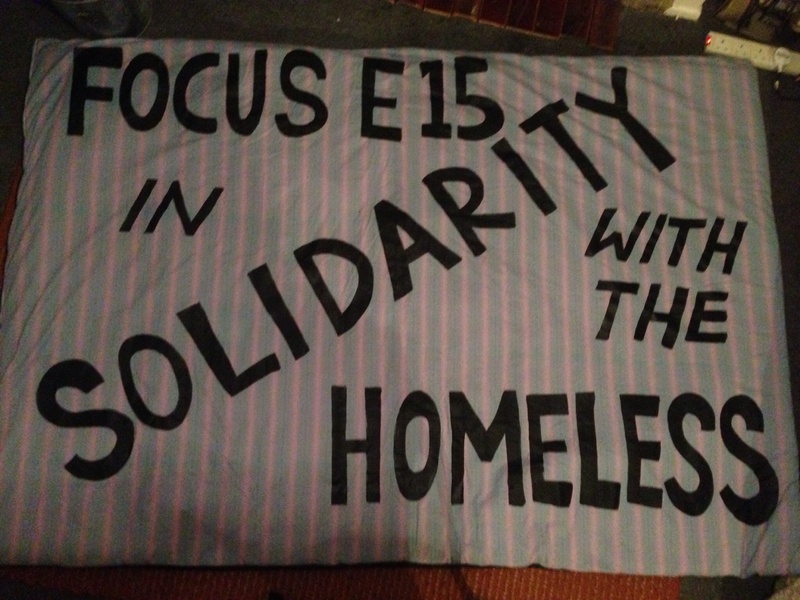 A home made quilted banner declared our solidarity with homeless people and as one Focus E15 campaigner clearly explained, ‘we are in solidarity with people facing homelessness and no intimidation by council or police will stop our campaign growing’. What is happening to people with their housing is unacceptable. More and more people are sleeping rough or left in temporary accommodation for years on end whilst at the same time many homes are sitting empty, such as the 400 or so homes on the Carpenters Estate. Robin Wales and Newham council encourage an Olympic legacy of gentrification on the one hand and evictions and social cleansing on the other. Let us not forget that Newham is one of the least affordable boroughs for private renting in the country and has one of the worst records in London for rehousing people out of the borough: last year Newham moved 423 homeless families out of London altogether. It is not good enough to leave people to sleep rough on our streets. Say no to street homelessness and join our campaign by getting involved in organising with us and by coming down to our weekly street stall in Stratford on the Broadway outside Wilkos from 12-2pm. Make your voice count.